Hi! I'm Helen and I love ice cream. And if you're here because you love it, too, then you've come to the right place. 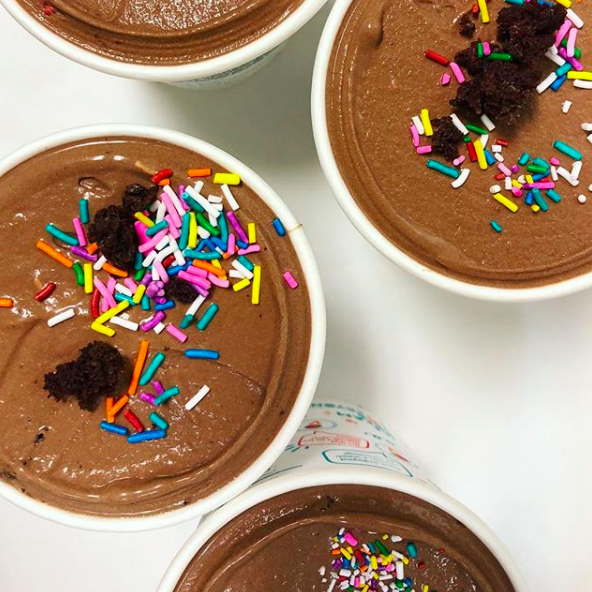 Best One Yet was founded on the idea that vegan ice cream (that's 100% plant-based with zero animal products) can be just as good as its traditional dairy counterparts. We want to make ice cream so good that you won't feel like it's missing anything (except the dairy, but you won't care). How? By using a technique perfected over many years of practice and real, whole ingredients: organic coconut milk, fair-trade cocoa, toasted nuts, spices and fresh, local produce and herbs. My promise: you don't have to be a vegan or lactose-intolerant to love Best One Yet ice cream. You just have to love ice cream. The best way to find the Vegan Vespa (that's right) is to check us out on Twitter, Instagram or Facebook for the most up-to-date locations. We'll be tweeting, posting and checking in as often as possible to let you know where to get your next vegan ice cream fix! You can also check out our calendar below for upcoming events this summer! Check out our calendar for meet-ups, open events & more! Give us the deets and we'll get started! READY TO SKIP TO THE GOOD PART? CHECK OUT OUR BOOKING OPTIONS HERE. Full disclosure: the best way to reach Best One Yet is via email. We're often on-the-go and may not receive calls while we're scooting (safety first!) or scooping. We'll always aim to return emails and phone calls with 24 business hours. Don't wanna wait? Come find us! Psst: check out our most recent press here. You wanna know some stuff & we're here to tell you. For starters, I love this question. It's great to ask if you aren't sure! Vegan simply means 100% free of animal or animal-derived products. So in ice cream terms, this means: no dairy, no eggs, no honey, no food dyes or colorings that may contain animal additives, etc. We're here to answer that question with another question: why not? Just kidding, kind of. Vegan ice cream answers a need for more than just the vegan community. There are a lot of people out there with dairy sensitivities or intolerances. And there are also people who just like good ice cream, which is exactly what Best One Yet sets out to provide. We're not just for vegans or the lactose intolerant. It's ice cream for everyone. Is your ice cream soy-free? Most of them! We have a few flavors that include ingredients that contain soy, but most of them do not. IS YOUR ICE CREAM PEANUT-FREE? Most of them! We do have several peanut butter based flavors but we also have many that contain zero peanuts or peanut butter. Is your ice cream TREE nut-free? No, no, no. I only emphasize this because I know nut allergies can be very, very serious. Coconuts are classified as a tree nut, so sadly if you have a slight or serious tree nut allergy, Best One Yet will not be for you. We also have some other flavors that incorporate other tree nuts such as almonds, pecans or walnuts. Of course, if you are allergic to some but not all of these tree nuts, we may still have some flavors that work for you! Thank you for asking! Best One Yet operates out of a shared commissary space. While we do our absolute best to avoid cross-contamination and will hope others do the same, we cannot guarantee the practices of others using our shared space. We always make sure to thoroughly clean the ice cream machine before use, even if it appears perfectly clean already, just in case. We also use separate processing equipment like cutting boards and knives for potential allergens like nuts. If you have any severe allergies or concerns, please let us know. And if we can't offer enough assurance that the product is free of your allergen, we'd rather you enjoy another product and be safe! What do you use to sweeten your ice cream? Is your ice cream healthy because it's vegan? Another good question! Best One Yet's ice cream is still very much dessert, which means it inherently can't be classified as a health food. As with any indulgence, moderation is key! But because we are committed to using zero animal products, less sugar and organic, local ingredients whenever possible, it is a dessert you can feel better about enjoying. Just ask! 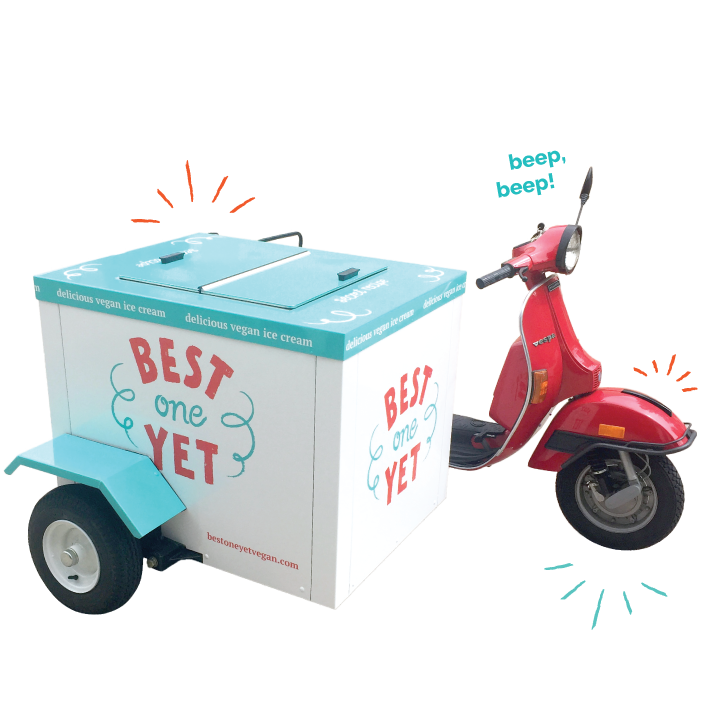 If you're interested in a specific flavor or a full range, email info@bestoneyetvegan.com for more information. We can also answer any questions about ingredients when we're out and about. As for our pints, you’ll find the ingredients printed on the packaging—convenient! Can I find your product in stores? YES! Find a complete list of locations here. The best way to find our current location (or where we're headed next) is to follow us on Twitter, Instagram or Facebook or check out our calendar. What if THE VEGAN VESPA ISN'T OUT AT THE MOMENT? Can I still get some ice cream? Heck yeah! Check out our Stores page for a complete list of locations. Bonus, you can also find our most recent ordering options here. Stay tuned for new locations to find our pints! We're on the move! YOUR PINTS SAY "BEST ENJOYED WITHIN ONE WEEK OF OPENING." WHY? Because we don't use any preservatives or artificial stabilizers (yay! ), every time the ice cream melts and re-freezes creates an opportunity for ice crystals to form. Ah, the dreaded ice cream freezer burn! While it's possible for this to happen to any frozen item, it's even more likely when the treat is preservative-free and repeatedly exposed to air. Of course, there's nothing harmful about this result, though it can make the ice cream a little less enjoyable. One week is only a suggested time frame – enjoy at your own pace! Can I hire you for my birthday party/wedding/family reunion/Office event? Yeah! Check out the Let's Party section for more details. Can I write about Best One Yet in my magazine/blog/other publication? Where Can I get One Of those Vegan Ice cream queen tees?! Yes! See here for current opportunities. What kind of vespa IS IT? It's a 1980 Vespa P200E. Of course! The Vegan Vespa often goes by her alias, Ruby Rose. Hit up JP at Sportique Scooters in Boulder, CO to tune up your steed. Talk to me about that sidecar. How much time do you have? It was 100% custom-built by Luis Bringas of BN Fabrications in Parker, CO. Currently: Cookie Dough Dream. Right? Have a question that we didn't answer? Drop us a line. upcoming events and more cool stuff! Don't worry, ice cream news only. And we won't share your info with anyone. **Local CO pickup and delivery only. New order forms with more information (such as pricing, flavors and locations for pickup) will be available each week. Thanks for your enthusiasm, Colorado! Let the order forms come to you. Sign up to receive flavor availability, locations and weekly order forms straight to your inbox. To sign up for our regular newsletter, go to the form in our FAQ section. Interested in ordering for a larger event? Let's Party! Find Best One Yet pints and scoops in select local markets throughout Colorado: exciting! Find our current location (or where we're headed next) on: Twitter, Instagram or Facebook or view our event calendar.